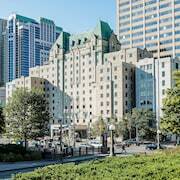 In the nation's capital, Cartier Place Suite Hotel is 0.3 kilometer (.18 miles) from Parliament Hill and a 5-minute walk from the Ottawa Convention Center. Good Service Everybody Was Helpful.Healthy food, room was great.will recommend to family and friends and will be happy to stay there again.thank you to all the front desk staff or being courteous. This property is clean and modern and using it was seamless. No issues.We needed a place for a night with more room than a hotel and at a reasonable price and that is what we got! The appartement was really nice, clean and exactly like advertised. We were really happy about our stay there. Very comfortable with an excellent location. Good communication. Very clean. As much as you love your short-term rental, it’s always good to get out and explore to soak up . Live like a local: Eat regional food, cheer on the home team, and visit the best cultural attractions in town. No matter the season, there is always something going on in . Seeing all the best attractions is bound to make you fall in love with Ottawa. Who knows, you may even be tempted to extend your vacation rental stay. There’s a reason home rentals are so popular here—after a long day of exploration, going back to your very own living room to stretch out is a dream come true.